This is, without a doubt, the greatest hardware hacking conference on the planet. Other hacking conferences get their reputation from the incredible talks and the hallway con where you can simply walk up to leading experts in whatever field you’re interested in. The Hackaday Superconference has that and so much more. There were attendees who dedicated their entire weekend to sitting at a folding table with a few soldering irons and wire cutters. This was their entire Supercon experience, and it was amazing. The back alley behind the Supplyframe Design Lab has a long and storied history of high voltage hacks. A year or so ago, the alley saw an Electric Pickle. The basic idea of this is to take a welder, stick a pickle between the electrodes, and let ‘er rip. First, the pickle turns into a sodium lamp with a beautiful orange glow. Once enough carbon builds up, this sodium lamp turns into a carbon arc lamp that bathes the retinas of everyone watching in ultraviolet light. It’s glorious. A Tindie head, after surviving 12,000 VAC @ 30mA. It still works. This year we didn’t have a welder, but we did have the next best thing: a transformer that outputs 12,000 VAC. This was brought in for [Will Caruna]’s workshop, Fun With High Voltage, where Supercon attendees made Lichtenberg figures on pieces of wood. This transformer was later repurposed for burning Lichtenberg figures into everything. The most interesting thing electrified? 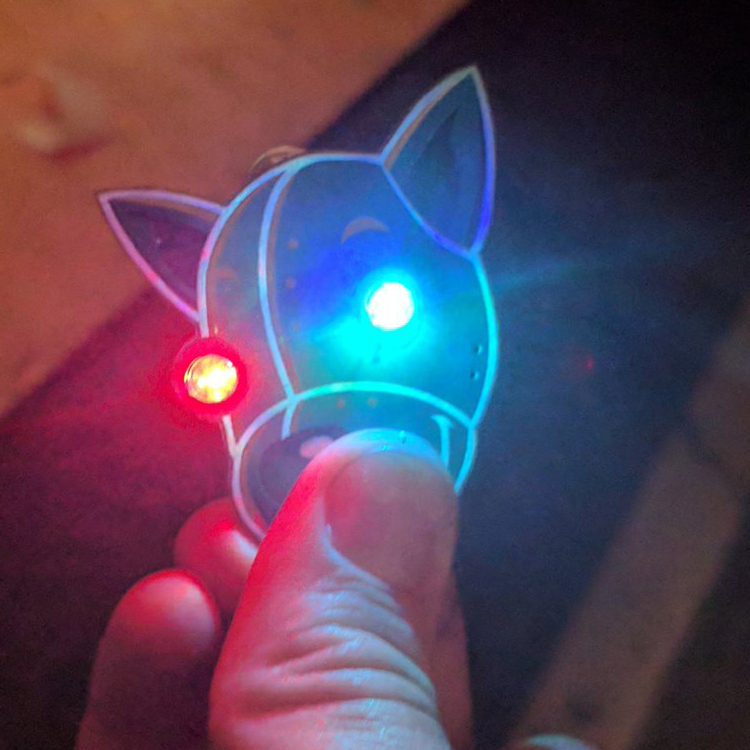 The Tindie Blinky Badge included in every Supercon swag bag. These Tindie heads stood up to 12,000 VAC, didn’t burn, didn’t explode, and worked afterward. There are a few opinions on how these were able to survive — I’m saying it’s because there are no traces on the board, and all the electrical connections are ground planes. Others are saying it’s because of the magical electronics embedded in the self-blinking LEDs. Nobody can provide a good answer as to why the Tindie badges are so resilient, which means we’ll just have to try harder at the next Supercon. Also on deck for the High Voltage hacks was [Sarah Petkus] and her innovative stun gun water bottle. All Supercon attendees received a water bottle in their swag bag, and [Sarah] turned hers into a stun gun. It should be noted that this is not a Tazer, because every time we put the word ‘Tazer’ on the site, Tazer International sends us a cease and desist, except for that one time when a Hackaday editor was Tazed at CES. Of course, not everyone was on the hardware hacking bandwagon just for the fun of it. This was a badge hacking competition, with fantastic prizes awarded for the best hacks on our conference badge. How did that go down? Check out the badge hacking award ceremony below. [Roger Cheng] took the prize with his film, In The Back Alley. There are several bits that made this the best film at the conference, the least of which is a panning time-lapse rig made just for the badge. This is a simple device with a clockwork mechanism designed to rotate the badge around a circle over the course of a few seconds. [Roger] started working on this project on the Wednesday before the con, something he was only able to do because the mechanical design of the badge was published earlier. [Roger]’s film doesn’t include any off-camera edits, but there’s still multiple scenes and title cards. How did he manage that? A bit of firmware hacking, of course. [Roger] developed a small program that would play videos in sequence and add title cards. The resulting video is played with just a touch of a button. This is what we want to see in a film festival submission for the Hackaday Superconference. [Roger] built hardware, he reprogrammed the badge, and he managed to make a good video in the process. In addition to a film festival, we challenged Superconference attendees to create a software hack for the badge. Thanks to the incredible work from [Mike Harrison] on the Superconference badge, we had a complete IDE, compiler, and a suite of header files that allowed everyone to start developing custom firmware for the badge right out the gate. The applications were incredible. [Ariane] snapped a few pictures on the badge, converted them to 1-bit bitmaps, and displayed these pictures on a Compaq — the original portable computer from 1983. The camera module was repurposed for object recognition to solve the puzzles from last year’s Superconference badge. It’s truly incredible how advanced these software hacks actually were, especially considering they were written in just two days. But of course with a badge hacking challenge, there must be a winner. 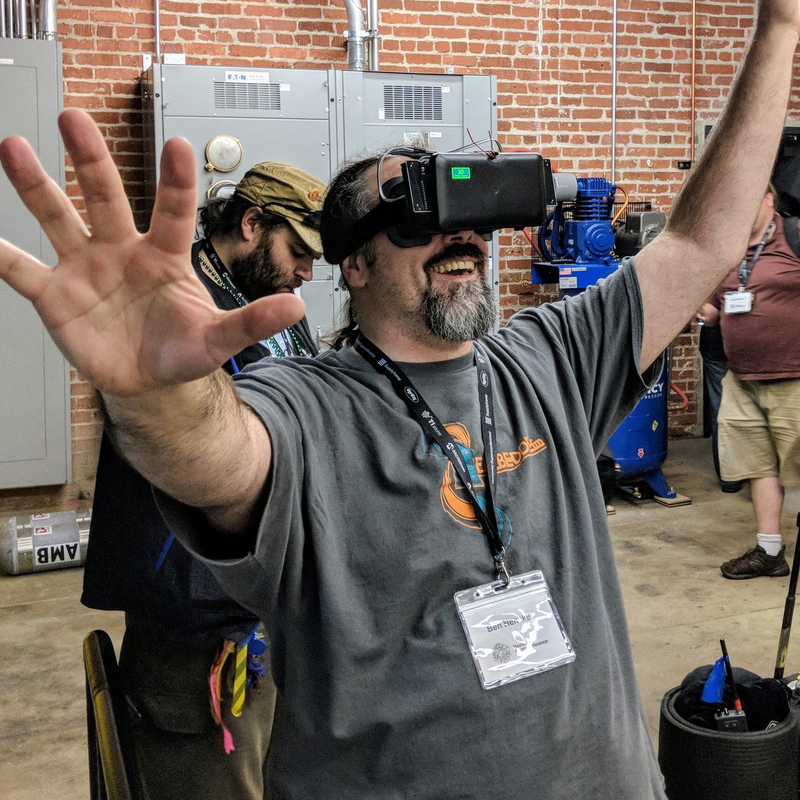 The winner of the best software hack for the 2017 Hackaday Superconference was [Ben Hencke] with his VR badge hack. This was actually a hack of two badges, connected together over a serial port. Once these badges are installed into a head-mounted display case, they turn into a stereoscopic virtual reality headset controlled by the accelerometer on the badge. The virtual environment is a maze, complete with color-shifting walls and animations of [Rick Astley]’s greatest contribution to humanity. None of this was written before the badge pickup party on Friday, and [Ben] leaned heavily on a tutorial for raycasting. An honorable mention for the best software hack has to go to this badge emulator. The runner-up for the best software hack goes to [graphiq] for his complete emulation of the 2017 Hackaday Superconference badge. Included in this emulation is a framebuffer, clickable buttons, mouseable accelerometer, and plans to emulate a camera with a webcam and analog input through a microphone. All of this was put together in two days, and even includes a fancy render of the Amazon batteries we sourced for the con. This is amazing, and a testament to how advanced the Supercon hacking scene actually is. Software hacks are one thing, but the Hackaday Superconference is a hardware conference. We gave out some really awesome badges, and challenged everyone to build hardware to exploit the pins and registers of the hardware hanging around their neck all weekend. The results were phenomenal. We had a tool to take panning time-lapse pictures, and a way to connect the badge to a Game Boy printer. No other conference on the planet will give you the breadth and depth of hardware hacking like the Hackaday Superconference will. But of course, there can only be one winner of the badge hacking challenge, and boy is this one a hoot. [Jacob Christ] built a 3D printer out of his badge. [Jacob] started his badge hack with a question — what could he do to top [Sprite_TM]’s badge hack last year where he rickrolled the entire conference with four badges? The answer, obviously, was to build a 3D printer out of a badge. This badge hack relies entirely on the OLED display used in the badge. After a bit of register tweaking and bit fiddling, [Jacob] found the display used in this badge could indeed cure UV-sensitive resin. The parts for this printer were built beforehand, with a UV-resistant cover manufactured by Ponoko, a NEMA 17 motor sourced from a junk drawer, and a shaft coupler held together with tape. This is truly a bodged-together printer, but it surprisingly worked. [Jacob] was able to print a very, very crude render of the Hackaday skull and wrenches, and with a little more work it’s entirely possible he could produce something resembling Benchy, everyone’s favorite tugboat and the de facto demonstration print for any 3D printer. No conference can top what came out of the badge hacking sessions at the 2017 Hackaday Superconference. Between burninating with 12,000 Volts and the exquisite software hacks that made the conference badge available to everyone, we couldn’t have asked for more. The Hackaday Superconference is the ultimate hardware conference, and we’re pleased that all the attendees were ready to go, power supplies and soldering irons in hand. We’re looking forward to the next Hackaday Superconference, where everything will surely be bigger, better, and have even more current at thousands of volts. Until then, we’re just happy all the attendees had a great time at the best hardware con on the planet. I worked with Jacob on the printer and we sourced a visible light curing resin, UV not needed. photocentricgroup.com redirected you too many times. Is there seriously no picture of the printed logo? There are a couple on the project page. cool, i’m gonna have to try harder to make it to the next conference in the EU. Suprised no one tried to make a multi rotor .. i guess that’s pretty old by now .. So what is the price for one of these badges anyway, is it included in the ticket ?